"I am kind of a big deal. People know me." These lines were immortalized by character Ron Burgundy in the popular film "Anchorman." We're not sure if it was his perfectly groomed hair or deep baritone voice that started it, but rumor has it that Mayo Clinic patient Mort Crim, prominent national correspondent and former Detroit anchorman, was a sort of inspiration for the parody that is Burgundy's character. But while he's not given to brag like Ron Burgundy, Mort actually is kind of a big deal. For starters, his list of celebrity interviewees is long and impressive. 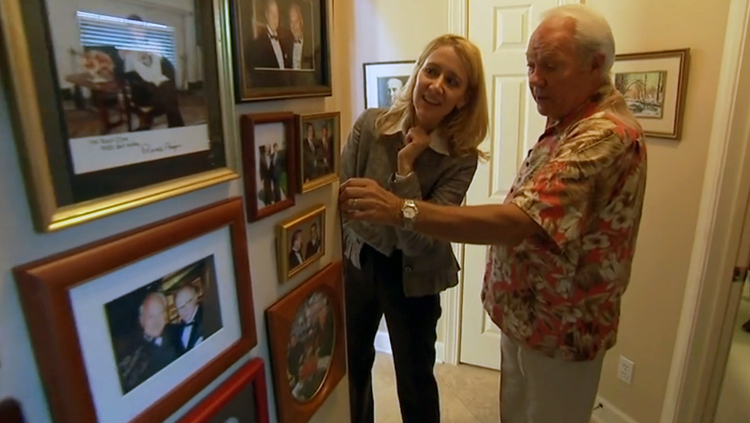 Photos of President Bill Clinton, Michael Jordan, Larry King and Walter Cronkite, among others, decorate his walls. As a national correspondent, Mort covered significant events such as the first landing on the moon, the assassinations of Rev. Martin Luther King Jr. and President John F. Kennedy, the beginnings of Watergate, and the Vietnam War. But among all his assignments, perhaps one of the most difficult was his battle with not one but two types of cancer: prostate and colon. And, to add to this, his wife Renée had breast cancer. Twice. The good news is that both Mort and Renée were treated successfully at Mayo Clinic in Florida. Mort credits his physician, George Kim, M.D., for early diagnosis of his colon cancer after the couple had moved to Jacksonville to be close to Mayo Clinic. Crim had gone to see a doctor because he was anemic. And as he told Sharing Mayo Clinic, "I thought, 'Well, I'm anemic. Just give me some iron, and I'll be on my way. But the doctor said, 'No, we need to find out why you're anemic,' and that's how we found the cancer so early." Similarly, Renée's cancer was also diagnosed early, which was good because it turned out to be very aggressive. She also credits Mayo Clinic for the attention to detail and proactive treatment after her mastectomy. As Mort tells it, "There is an attitude at Mayo Clinic, and it starts at the top and goes throughout the organization. They pay attention, and they care about their patients." Today, both Mort and Renée are doing well and continue to receive routine care at Mayo Clinic. About a year ago, Mort, the newsman, got a bit of great news himself: He was told that he was officially cured and didn't need to see Dr. Kim anymore. Without Mayo Clinic, Mort says his health challenges would have "impacted his ability to be, to exist." As for "Anchorman," Mort says, "It came up very unexpectedly, and it's taken on a life of its own." He's been getting plenty of press -- and has had a bit of fun with it -- with the recent release of "Anchorman 2: The Legend Continues." When Geraldo Rivera asked him if he was offended by being the inspiration for Burgundy's character, he said, not so much, "As long as I know it's a comedy and not a documentary." And when Piers Morgan asked him about being invited to the sequel's premier, he simply suggested, tongue in cheek, that, "Yes, it'll be really a great opportunity for Will Ferrell to meet me." You can learn more about why Mort Crim is kind of a big deal here and in the video below. Then stay classy, share your comments, and while you're at it, share this story with others through our handy social media tools.